Baekdu Mountain (Baekdusan), also known as Changbai Mountain in Chinese, is a volcanic mountain on the border between North Korea and the Manchurian region of China. At 2,744 m, it is the highest mountain of the Changbai Mountains to the north and Baekdudaegan to the south, and higher than any other mountain in Korea or Manchuria. The Korean name, Baekdu-san, means "white-headed mountain." Both the Chinese name, Changbai Shan and Manchu name, Golmin Šanggiyan Alin mean "perpetually white mountain." One of the highest crater lakes in the world, called Heaven Lake (Lake Cheonji (천지)in Korean / Lake Tianchi (天池) in Chinese), lies at the top of the mountain. Baekdusan marks the northern boundary of Korea, and the location where Korea's foundation myths regarding Dangun take place. 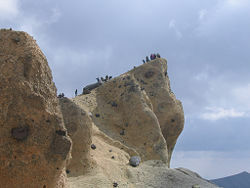 Baekdusan's volcano, Baitoushan, had its most recent minor eruptions in 1702 and 1903, and it is now considered to be dormant. 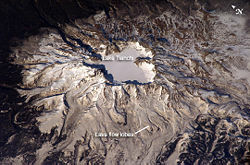 Baitoushan's most recent major eruption, around 1000 C.E., one of the largest in the modern Holocene geologic period, deposited erupted ash material as far away as Hokkaido, in Northern Japan, about 1,200 km away, and created the 4.5 kilometer diameter crater, about 850 meters deep that contains Heaven Lake. Sixteen peaks exceeding 2500 m surround the lake. From mid-October to mid-June, Heaven Lake is covered with ice. The lake has a circumference of 12 to 14 kilometers, an average depth of 213 m and maximum depth of 384 m. Water flows north out of the lake, and near the outlet there is a 70 meter waterfall. Heaven Lake is popular with tourists, known both for its natural beauty and for sightings of an unidentified creature living in its waters. The central section of the mountain rises about 3 mm every year, due to rising levels of magma below the central part of the mountain. The highest peak, called Janggun Peak, is covered in snow about eight months of the year. The slope is relatively gentle until about 1800 m. The mountain is the source of the Songhua, Tumen (Tuman) and Yalu (Amnok) rivers. Baekdusan is the northern end of the Baekdu Daegan Mountain Range System which extends 1,400 km, forming the backbone of the Korean peninsula, and dividing the Korean watersheds. The weather on the mountain can be very erratic. The annual average temperature at the peak is about -8.3 degrees Celsius. During summer, temperatures of about 18 degrees Celsius can be reached, and during winter temperatures can drop to -48 degrees Celsius. Average temperature is -24 degrees Celsius in January, 10 degrees Celsius in July, remaining below freezing for eight months of the year. Average wind speed is 42 kilometers (26.1 mi) per hour, peaking at 63 kilometers (39.1 mi) per hour. Relative humidity averages 74%. There are five known species of plants in the lake on the peak, and some 168 were counted along the shores. The area is a known habitat for tigers, bears, leopards, wolves, and wild boars. Deer in the mountain forests, which cover the mountain up to about 2000 meters, are of the Baekdusan roe deer variety. Many wild birds such as black grouse, owls, and woodpecker are known to inhabit the area. 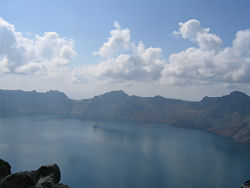 Baekdu (Changbai) Mountain, a dormant volcano between China and North Korea, has one of the highest crater lakes in the world, called "Heaven Lake"
The Chinese-Korean border divides the mountain into two, running down the middle of the crater lake. The Baekdu/Changbai Mountain has been worshiped by the surrounding peoples throughout history, and is still considered sacred by the Korean population living nearby. Koreans and Manchus alike consider it the place of their ancestral origin. 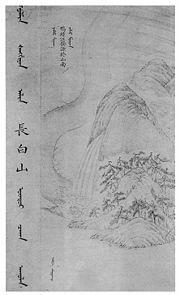 The first written record of Baekdusan is recorded in the Chinese classic text Shan Hai Jing with the name Buxian Shan (不咸山,即神仙山, the Mountain with God). It's also called Shanshan Daling (單單大嶺, the Big Big Big Mountain.《說文》：“單，大也。”) in the Canonical Book of the Eastern Han Dynasty. In the Canonical Book of the Tang Dynasty, it was called Taibai Shan (太白山, the Grand Old White Mountain). The current Chinese name Changbai Shan （長白山. Perpetually White Mountain）was first used in the Liao Dynasty (907-1125) and then the Jurchen Jin Dynasty (1115-1234). The Jurchen Jin Dynasty (1115–1234) bestowed the title "the King Who Makes the Nation Prosperous and Answers with Miracles" (興國靈應王 Xingguo Lingying Wang) on the mountain god in 1172 and it was promoted to "the Emperor Who Cleared the Sky with Tremendous Sagehood" (開天宏聖帝 Kaitian Hongsheng Emperor) in 1193. During the Manchu Qing Dynasty, the Kangxi Emperor designated Changbai Mountain as the legendary birthplace of the imperial family Aisin Gioro following a survey, although it is no longer supported. He set a forbidden zone around the mountain, although it was still in dispute whether it was part of Korea (Joseon) or China. The Qing Dynasty held annual rites for the mountain, as did the earlier Jin Dynasty. The legendary beginning of Korea's first semi-mythical kingdom, Gojoseon (2333 B.C.E.–108 B.C.E. ), takes place here. Buyeo (2nd c. B.C.E. - 494), Goguryeo (37 B.C.E. - 668), and Balhae (698 - 926) kingdoms also considered the mountain sacred. The Goryeo dynasty (935–1392) first called the mountain Baekdu, recording that the Jurchens across the Yalu River were made to live outside of Baekdu Mountain. The Joseon Dynasty (1392-1910) recorded volcanic eruptions in 1597, 1668, and 1702. King Sejong the Great of Joseon strengthened the fortification along the Tumen and Yalu rivers, making the mountain a natural border with the northern peoples. Dense forest around the mountain provided bases for Korean armed resistance against the Japanese occupation, and later communist guerrillas during the Korean War. North Korea claims that Kim Il-sung organized his resistance against the Japanese forces there and that Kim Jong-il was born there, although records outside of North Korea show that these events took place a short distance within the borders of the Soviet Union. Because of the continuous entry of Korean people into Gando, a region in Manchuria that lay between the Tumen and Yalu Rivers, in 1712, Manchu and Korean officials surveyed the area and negotiated a border agreement. To mark the agreement, they built a monument describing the boundary at a watershed, near the south of the crater lake at the mountain peak. The interpretation of the inscription caused a territorial dispute from the late nineteenth century to the early twentieth century, and is still disputed by academics today. The 1909 Gando Convention between Qing and Japan (while Korea was a Japanese colony) recognized the area north and east as Chinese territory. The border was further clarified in 1962, when China and North Korea negotiated a border treaty on the mountain border in response to minor disputes. The two countries agreed to share the mountain and the lake at the peak, with Korea controlling approximately 60 percent and gaining approximately 230 km² in the treaty. Some South Korean groups argue that recent activities conducted on the Chinese side of the border, such as economic development, cultural festivals, infrastructure development, promotion of the tourism industry, attempts at registration as a World Heritage Site, and bids for a Winter Olympic Games, are an attempt to claim the whole mountain as Chinese territory. These groups object to China's use of Changbai Mountain, which has been used since the Liao Dynasty (907–1125) and the Jurchen Jin Dynasty (1115–1234).Some groups also regard the entire mountain as Korean territory that was given away by North Korea. During the 2007 Asian Winter Games, which were held in Changchun, China, a group of South Korean athletes held up signs during the award ceremony which stated "Mount Baekdu is our territory." Chinese sports officials delivered a letter of protest on the grounds that political activities violated the spirit of the Olympics and were banned in the charter of the International Olympic Committee and the Olympic Council of Asia. The head of the Korea Olympic Committee responded by stating that the incident was spontaneous and held no political meaning. The incident did not escalate into a major source of friction between South Korea and China. Foreign visitors, including South Koreans, usually climb the mountain from the Chinese side, although Baekdusan is a common tourist destination for the few foreign tourists in North Korea. There are a number of monuments on the North Korean side of the mountain. Baekdu Spa is a natural spring and is used for bottled water. Pegae Hill is a famous camp site of the Korean People’s Revolutionary Army during their struggle against Japanese colonial rule. There are also a number of secret camps which are now open to the public. There are several waterfalls, including the Hyongje Falls which splits into two separate falls about a third from the top. ↑ Smithsonian Institution Global Volcanism Program: Baitoushan. Retrieved November 9, 2007. ↑ BBC World China Seeks U.N. Title to Mt. Baekdu, July 31, 2006, Donga. Retrieved November 9, 2007. ↑ China Upset with "Baekdu Mountain" Skaters. Chosun. Retrieved May 6, 2016. "There are no territorial disputes between China and South Korea. What the Koreans did this time hurt the feelings of the Chinese people and violated the spirit of the Olympic Charter and the Olympic Council of Asia," the official said, according to the China News." Hetland, E.A. et al. Crustal structure in the Changbaishan volcanic area, China, determined by modeling receiver functions. Tectonophysics 386(3-4) (2004): 157-175. This page was last modified on 6 May 2016, at 22:09.